There is no safe, effective human vaccine against brucellosis. Live attenuated Brucella strains are widely used to vaccinate animals. However these live Brucella vaccines can cause disease and are unsafe for humans. Killed Brucella or subunit vaccines are not effective in eliciting long term protection. In this study, we evaluate an approach using a live, non-pathogenic bacteria (E. coli) genetically engineered to mimic the brucellae pathway of infection and present antigens for an appropriate cytolitic T cell response. E. coli was modified to express invasin of Yersinia and listerialysin O (LLO) of Listeria to impart the necessary infectivity and antigen releasing traits of the intracellular pathogen, Brucella. This modified E. coli was considered our vaccine delivery system and was engineered to express Green Fluorescent Protein (GFP) or Brucella antigens for in vitro and in vivo immunological studies including cytokine profiling and cytotoxicity assays. The E. coli vaccine vector was able to infect all cells tested and efficiently deliver therapeutics to the host cell. Using GFP as antigen, we demonstrate that the E. coli vaccine vector elicits a Th1 cytokine profile in both primary and secondary immune responses. Additionally, using this vector to deliver a Brucella antigen, we demonstrate the ability of the E. coli vaccine vector to induce specific Cytotoxic T Lymphocytes (CTLs). Protection against most intracellular bacterial pathogens can be obtained mostly through cell mediated immunity. Data presented here suggest modified E. coli can be used as a vaccine vector for delivery of antigens and therapeutics mimicking the infection of the pathogen and inducing cell mediated immunity to that pathogen. There is no safe, effective human vaccine against brucellosis . Brucellosis is a zoonotic disease causing chronic fatigue, arthritis, recurrent fever, endocarditis, and orchitis in humans [2, 3]. The etiologic agents for brucellosis are the closely related, facultative, gram-negative, intracellular coccobacilli, Brucella species [4, 5]. The ease with which Brucella can be transmitted by aerosolization, and the unpredictable timing of the onset of symptoms raise the specter of a potentially insidious bioterror attack [6–9]. During the course of infection, Brucella are actively phagocytosed by macrophages or other phagocytic cells where they prevent phagosome-lysosome fusion, persist and replicate in endocytic compartments that acquire endoplasmic reticulum membranes [10, 11]. Bacteremia occurs during an acute phase that is hard to define or detect [12, 13]. Live attenuated Brucella strains are widely used to vaccinate animals against brucellosis. However, these live Brucella vaccines can cause disease and are unsafe for humans [14–17]. Killed Brucella or subunit vaccines are not effective in eliciting long term protection . Therefore, a new vaccine approach is needed. Eliciting a specific T cell response is necessary to fight Brucella infection. Numerous studies have shown that Th1 or cell mediated immunity is crucial for protection against brucellosis  however Th2 or humoral immunity also participates in protecting the host [20–23]. Adoptive transfer of Brucella immune T cells protects mice against virulent Brucella infection [24, 25] with both CD4+ and CD8+ T cells involved in immunity [26, 27]. Nevertheless, murine brucellosis is markedly exacerbated in MHC I knockout mice that lack CD8+ T cells compared to CD4+ T cell deficient mice or wild type mice . In fact numerous studies have shown that a CTL response is key to effective Brucella immunity [26, 28–30]. Our approach utilizes a non-pathogenic Escherichia coli to mimic the intracellular pathogen Brucella melitensis in delivery and presentation of antigens to stimulate a Th1 and CTL response. E. coli are normally extracellular while Brucella are intracellular bacteria. Therefore, we engineered E. coli (DH5α) to express a plasmid containing the inv gene from Yersinia pseudotuberculosis and the hly gene from Listeria monocytogenes . Introduction of inv confers E. coli invasion of host cells by binding the αβ1-integrin heterodimer. Upon clustering of integrins, invasin activates signaling cascades. One signaling pathway causes activation of components of focal adhesion complexes including Src, focal adhesion kinase, and cytoskeletal proteins, leading to the formation of pseudopods that engulf the bacteria into the host cell. Binding of invasin to β1-integrin is necessary and sufficient to induce phagocytosis of the bacteria even by non-professional phagocytic cells. A second pathway including activation of Rac1, NF-κB, and mitogen-activated protein kinase, leads to production of proinflammatory cytokines . After internalization, E. coli is taken into the phagosome/lysosome where lysis of the bacterium occurs. The hly gene product, along with other bacterial proteins, is release into the lysosomal vesicle. The sulfhydryl-activated hly, also known as listeriolysin O (LLO) is a pore-forming cytolysin capable of binding and perforating phagosomal membranes at low pH . The cytoplasmic contents of the bacteria can then escape into the cytosolic compartment of the mammalian cell through the pores generated by LLO. This critical step exports antigen from the E. coli into the cytosol where further processing by proteosomes and translocation by TAP into the endoplasmic reticulum lumen occurs for MHC class I presentation . LLO is sufficient for MHC class I presentation of Ag when co-expressed in E. coli that are phagocytosed by Antigen Presenting Cells (APC) such as macrophages and dendritic cells [34, 35]. Using similar recombinant E. coli, others have shown successful delivery of genes and molecules [31, 34–44]. In this study, we investigate the potential of inv-hly expressing recombinant E. coli as a vaccine vector for immunization against the intracellular pathogen, Brucella. Cells were maintained in RPMI 1640 medium (Invitrogen) supplemented with 10% fetal calf serum (FCS), 4.5% dextrose, 1 mM sodium pyruvate, and antibiotic-antimycotic solution (100 μ/ml penicillin G sodium, 100 μg/ml streptomycin sulfate, 0.25 μg/ml amphotericin B). In addition, drugs used for selection were: Blasticidin-S (Invivogen; 10 μg/ml) and G418-sulfate (Alexis Biochemical; 400 μg/ml). Cell lines included: D17 (ATCC CCL-183), TB1 (ATCC CCL-88), J774A.1 (ATCC TIB-67), HeLa S3 (ATCC CCL-2.2), RAW 264.7 (ATCC TIB-71), HEK 293 (ATCC CRL-1573), FLK , and the cytotoxicity target cell line RAW/YFP . BALB/c female mice (H-2d), 4–6 wks old were purchased from Jackson Laboratory and injected with 0.1 ml of PBS i.p. one day prior to E. coli vaccinations to prevent the mice from succumbing to LPS-induced endotoxic shock from live E.coli. Intraperatoneal (i.p.) route of vaccination was chosen to best deliver live E. coli vector vaccine to mice based on consistency of results and ease of method. Recombinant E. coli vaccines were injected i.p. with 2 × 107 E.coli in PBS. PBS was used for negative controls. For experiments examining primary immune response cytokine profiles, mice were injected with E. coli vector vaccine and after 5 h, euthanized and spleens removed. 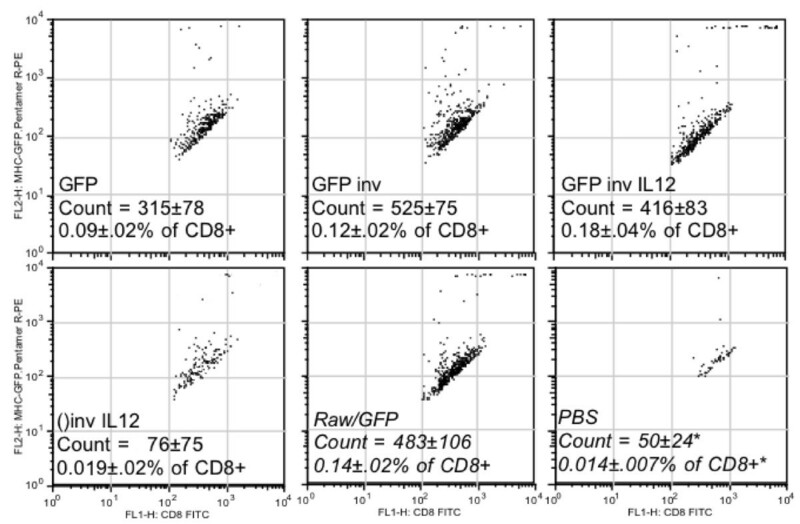 For experiments enumerating antigen-specific CD8+ T cells, RAW264.7 macrophages (H-2d) expressing GFP (RAW/GFP; ) was subjected to gamma-irradation (2 KR) and 1 × 106 cells in PBS were vaccinated in mice i.p. following the same protocol as the E. coli vaccines. Animals were boosted with the same dose two weeks later. Four weeks after the final boost, animals were euthanized and spleens harvested and processed for CTL assays. Live imaging was performed (IVIS; Caliper Biosciences, Inc.) with animals anesthetized using Isofluorane. IVIS image analysis was performed using Living Image 3.0 software (Caliper Biosciences). Each group of mice consisted of 4 animals. All animal experiments were conducted with approval from the Institutional Animal Care and Use Committee. The prokaryotic expression vector pGB2Ωinv-hly (10.05 kb; spectinomycin resistance) was a gift from C. Grillot-Courvalin and expresses invasin from Yersinia pseudotuberculosis and listeriolysin O (LLO) from Listeria monocytogenes; pMC221 (4.9 kb; chloramphenicol resistance) expresses uvGFP; pXen-13 (pSK luxCDABE; 8.8 kb; ampicillin resistance) was obtained from Caliper Life Sciences and carries the luxCDABE operon for engineering bioluminescent Gram-negative bacteria. The eukaryotic expression vector pEYFP-N1 (4.7 kb; kanamycin resistance) was purchased from Clontech and expresses enhanced yellow fluorescent protein (EYFP); pORF-mIL12 (4.8 kb; ampicillin resistance) was purchased from Invivogen and expresses both chains of a functional murine IL-12 connected by a linker. The retroviral vector pLNCX2/EYFP (kanamycin/neomycin resistance) was engineered using pLNCX2 (BD Biosciences) and the EYFP from pEYFP-N1. The retroviral vector pLNCX2/BMEII1097 was engineered similarly using the Brucella BMEII1097 gene from pDONR201/BMEII1097 of the Brucella ORFeome purchased from OPEN Biosystems . BMEII1097 is a probable transcription regulator syrB. This retroviral vector was used to transduce Raw 264.7 cells to be used as targets for CTL assays. The prokaryotic expression vector pDEST17/BMEII1097 was engineered from pDEST17 (invtrogen) and pDONR201/BMEII1097. All Escherichia coli used in these studies were strain DH5α™ (Invitrogen) except for recombinants expressing pDEST17 vectors were we used BL21-AI™ (Invitrogen). Table 1 describes the recombinant E. coli vector vaccines. aAll E. coli used in these studies were DH5a™ except E. coli inv B7 which is strain BL21-AI™. One day prior to cell infection, eukaryotic cell lines were seeded at 2 × 105 cells/well in a six-well plate (or two well chambered coverslips for fluorescent microscopy) in 2 ml/well RPMI with 10% fetal calf serum (Invitrogen) and grown in a humidified CO2 incubator at 37°C. E. coli were grown overnight in a shaking incubator at 37°C in LB broth (Difco) supplemented with appropriate antibiotic for plasmid selection. The following day, bacteria were counted by 600 nm absorbance spectrometry and added to washed eukaryotic cells in fresh medium without antibiotic at the specified MOI. Bacteria were then centrifuged onto the monolayer at 2 krpm for 5 min at room temperature. Cells were incubated for 90 min, washed and fresh medium added supplemented with 100 μg/ml gentamicin to kill extracellular bacteria. For invasion assays, cells were incubated for an additional 90 min to kill extracellular bacteria, then washed and lysed in 200 μl of 1% triton X-100 for 5 min at room temperature. Finally, 800 μl of LB broth was added to each well and CFU were determined on LB agar plates supplemented with chloramphenicol, the selection drug for the GFP plasmid. For gene delivery assays, cells were incubated then analyzed by fluorescent microscopy. Random fields of cells were counted and scored for fluorescence at indicated times. For IL-12 assays, infected cells were fixed and permeabilized using Cytofix/Cytoperm™ (BD Biosciences) following the manufacturer's protocol. Samples were stained using IL-12 (p40/p70) PE conjugated monoclonal antibody (BD Biosciences) and analyzed by flow cytometry. Pooled splenocytes from four mice per immunization group were isolated and density gradient purified (Fico/Lite-LM (Mouse); Atlanta Biologicals). Leukocytes were subjected to non-T cell depletion using a Pan T Cell Isolation Kit and MACS separation (Miltenyi Biotec) following the manufacturer's protocol. Aliquots of 2 × 106 T cells were then used for flow cytometry or cytokine profiling. R-PE labeled Pro5® MHC class I pentamers GFP antigen specific for T cell receptors of H-2Kd HYLSTQSAL were co-stained with FITC labeled rat anti-mouse CD8α and used for flow cytometry along with controls following the manufacturer's suggested protocol (Proimmune). Controls included R-PE labeled rat anti-mouse CD3ε (SouthernBiotech), and R-PE and FITC anti-rat IgG2a and anti-rat IgGκ (BD Biosciences). 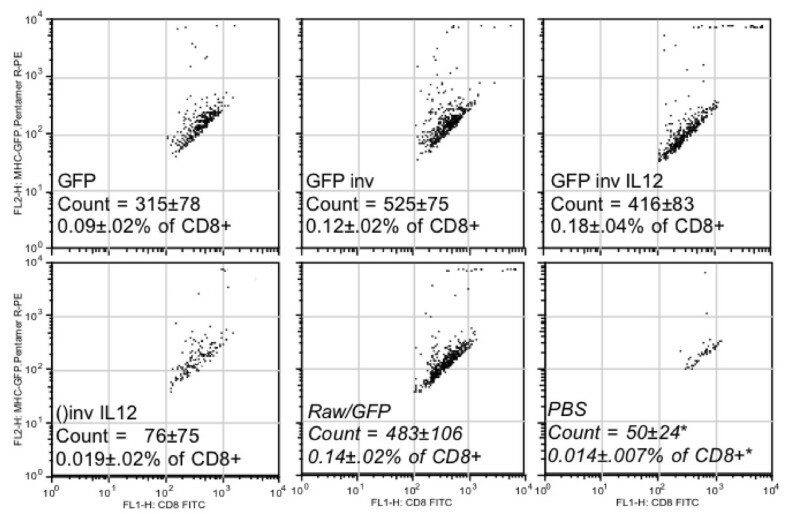 Flow cytometry analysis was performed on 3.5 × 105 cells for each immunization group. For cytokine profiling, T cells from immunized and control mice were incubated with gamma-irradiated (2 KR) RAW 264.7 macrophages on 6 well plates with or without the addition of 50 mM GFP peptide (HYLSTQSAL; A&A Labs LLC) for 3 days. Supernatant was harvested, centrifuged to remove cell debris and processed using a Th1/Th2 cytokine kit by cytometric bead array (BD Biosciences). Data acquisition and analysis was performed according to the manufacturer's instructions using flow cytometry. Splenocytes from immunized mice were isolated and gradient purified (described above) for use as effector cells. Transduced RAW 264.7 cells expressing GFP or BMEII1097 were cloned by limiting dilution and used as target cells. Cytotoxic effector cells were expanded in vitro by growth on confluent 2 KR gamma-irradiated target cells in six-well plates supplemented with 10% T-stim without Con A (BD Biosciences) for three days. Effector cells were then washed and purified through a density gradient. Cells were counted and assayed using a CytoTox 96® Non-Radioactive Cytotoxicity kit (Promega) following the manufacturer's protocol with 4 h incubation. Acquisition was performed on a FACSCalibur flow cytometer (BD Biosciences) and analyzed using FlowJo 8.7.1 software (Tree Star, Inc). Retrovirus-mediated gene transfer was accomplished using the BD Retro-X System (BD Biosciences) following the manufacturer's suggested protocol. Briefly, 100 × 20 mm tissue culture dishes (Falcon) were seeded with the packaging cell line GP2-293 at 70–90% confluency. GP2-293 cells were co-transfected with 5 μg each of retroviral vector and the envelope glycoprotein expression vector pVSV-G using 15 μl/transfection of Lipofectamine 2000 (Invitrogen) for 3 h in a total volume of 5 ml medium/dish. Subsequently, transfection medium was replaced with 10 ml growth medium, and the cells incubated for 72 h. Retrovirus-containing supernatant was harvested, filtered (0.45 μm), and concentrated by ultracentrifugation. Supernatant was removed and virus resuspended in the residue (~200 μl) and frozen (-80°C). Cells for transduction were plated on 6-well tissue culture plates (Falcon) at 50% confluency. Concentrated retrovirus (titer unknown) along with polybrene (8 μg/ml) were added to 1 ml/well cells and incubated overnight. Transduction medium was replaced with fresh growth medium, and the following day cells were split into appropriate selective medium. Cell lines (2 × 105 cells/well) were incubated on glass coverslips in six-well plates overnight at 37°C in a CO2 humidified incubator. Using conditions as with invasion assays, invasive or non-invasive E. coli were incubated with the cells at MOI 100 for 90 min. The cells were thoroughly washed to remove extracellular bacteria followed by gentimycin incubation for an additional 90 min. Cells were washed in PBS and fixed in Karnovsky's Fixative (Electron Microscopy Sciences) following manufacturer's protocol. TEM was performed at the University of Wisconsin Medical School Electron Microscope Facility http://www.micro.wisc.edu/. Figures were imported using Adobe Photoshop CS3 10.0.1. Student's t-test was performed and results expressed as the arithmetic mean with the variance of the mean (mean ± SE). The objective of this study was to take a non-pathogenic organism such as Escherichia coli and genetically engineer it to mimic infectivity and intracellular antigen trafficking of a pathogen such as Brucella melitensis. The engineered bacteria would then be employed as a vaccine vector for Brucella antigen delivery and evaluated for immune response. E. coli are normally extracellular, and taken up and destroyed by phagocytic cells such as macrophages. We transformed GFP expressing E. coli DH5α (E. coli gfp) with a plasmid encoding invasin from Yersinia pseudotuberculosis and LLO from Listeria monocytogenes (E. coli gfp+inv) and tested whether these E. coli were invasive to non-professional as well as professional phagocytic cell lines. Non-invasive E. coli (E. coli-gfp) or invasive E. coli (E. coli gfp+inv) were added to different cell lines and analyzed by fluorescent microscopy. Addition of invasive E. coli to all cell lines, phagocytic and non-phagocytic, resulted in intracellular fluorescent bacteria. However, only minimal non-invasive E. coli fluorescence was observed in non-phagocytic cell lines (D17, FLK, 293, TB1), but was present in macrophage cell lines (RAW and J774). An example with TB1 and RAW264.7 cells is shown in Figure 1. To further determine whether the invasive E. coli were intracellular, invasion assays were performed (Table 2). Note non-invasive E. coli were not recovered unless a high MOI was used. In contrast, large numbers of invasive E. coli were recovered from all cell lines analyzed. Furthermore, electron microscopy showed invasive E. coli bound to the cell surface and engulfed by lamellipodia consistent with invasin-integrin interactions (Figure 2). Non-invasive E. coli were also used in the TEM assay, but could not be detected within or surface-bound to any non-phagocytic cell line (data not shown). Recombinant invasive E. coli infects phagocytic and non-phagocytic cells. The macrophage cell line, RAW 264.7 and epithelial cell line, TB1, were incubated with GFP-expressing E.coli (E. coli gfp) or co-expressing invasin (E. coli gfp+inv) at MOI of 10 for 3 hours, washed, and after 24 h in gentimicin media, imaged by fluorescent microscopy. The image shows two representative fields at equivalent scale of each treatment and cell line. Transmission Electron Microscopy shows recombinant invasive E. coli similarly engulfed by non-professional phagocytic cells (D17, HeLa) and phagocytic cells (Raw). The osteosarcoma cell line D17, epithelial cell line HeLa, and macrophage cell line Raw were incubated with recombinant invasive E. coli (MOI 10) for 3 hours, washed, fixed and processed for TEM. Image demonstrates each cell line engulfing E. coli (arrows) with lamellipodia. Scale bar indicates 2 microns. Since our intent is to use the invasive E.coli as a live vaccine vector, we examined localization and persistence of the vector in vivo. We transformed lux operon expressing E. coli DH5α (constitutively bioluminescent) with the inv-hly encoding plasmid as our invasive E. coli (inv E. coli). Mice were intraperitoneal injected with non-invasive or invasive bioluminescent E. coli and analyzed by biophotonic imaging over time. Both bioluminescent species trafficked to the spleen. However, the invasive E. coli vector persisted longer at the site of injection suggesting an extended period of antigen delivery (Figure 3). In Vivo biophotonic imaging of mice vaccinated with non-invasive ( N ) or invasive ( Inv ) bioluminescent E. coli indicate similar trafficking from the intraperitoneal site of injection but prolonged antigen expression of the recombinant invasive E. coli vaccine. Mice vaccinated i.p. were anesthetized and imaged at time points indicated. After 80 min, bioluminescent invasive E. coli were still detectable at the site of injection indicating live bacteria. Unlike Escherichia, Brucella, after being engulfed by the cell, escape phagosome lysis and multiply at the endoplasmic reticulum. Most likely, this process leads to MHC class I presentation of Brucella antigens by the host cell . Escherichia, in contrast, are phagocytosed and rapidly destroyed with antigens being presented by MHC class II [49, 50]. Therefore, the inv expressing plasmid co-expresses hly (hemolysin) to enhance MHC class I presentation of antigens carried by the invasive E. coli vaccine vector. Hemolysin (hly) or LLO perforates phagosomal membranes at low pH and the contents of the vaccine are released into the cytosol of the cell . To test the functionality of the hly gene product in the E. coli vector, we first examined delivery of a eukaryotic expression plasmid, pEYFP-N1 expressing yellow fluorescent protein (YFP) under control of the eukaryotic CMV promoter, using fluorescent microscopy. Table 3 shows results after two or seven days post infection (MOI 100) of confluent cells lines. Only the LLO expressing E. coli vector transferred functional YFP plasmid to all mammalian cells tested. Interestingly, the number of YFP positive cells per total cells increased as time progressed. Also, two days post-infection no YFP positive macrophages (RAW, J774) were observed, but after seven days fluorescent positive cells were similar to the non-phagocytic cell lines. Data indicate that the early choice of a Th1 (cellular) or a Th2 (humoral) immune response is dependent mainly on the balance between interleukin-12 (IL12), favoring a Th1 response, and interleukin-4 (IL4), favoring a Th2 response [52, 53]. Vaccine studies have demonstrated that co-deliverance of IL12 with the antigen increases Th1 response to the vaccine [54–57]. Thus, we included a murine IL12 eukaryotic expression plasmid in the invasive E. coli vaccine vector and tested for delivery and expression of IL12 in cell culture. 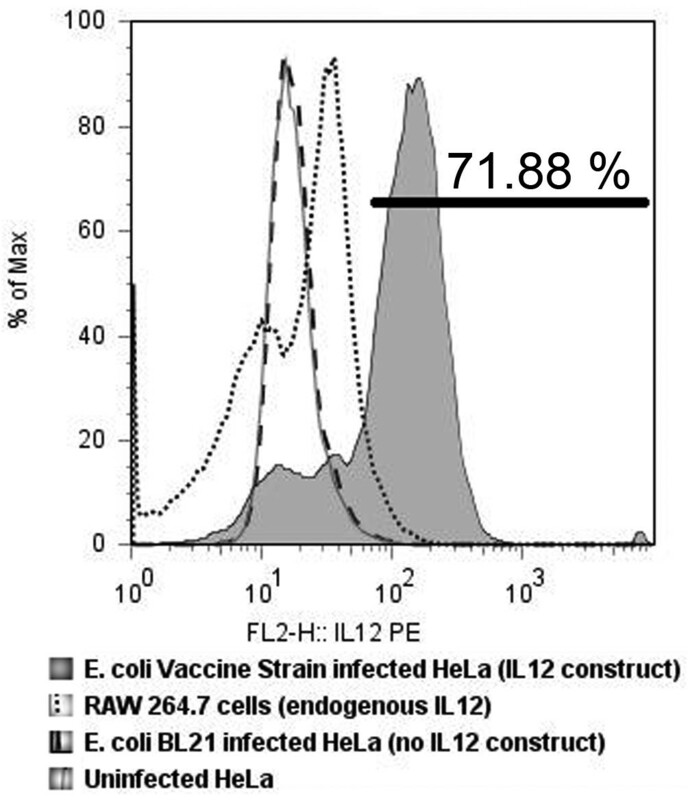 Using human HeLa cells, microfluorimetry analysis demonstrated greater than 70% of E. coli vaccine infected cells were positive for murine IL12 (Figure 4). This compared favorably to endogenous murine IL12 production by mouse Raw264.7 macrophage cell positive control. Therefore, the E. coli vaccine vector was effective in delivering therapeutics to the host. Microfluorimetry of supernatant of HeLa cells expressing murine IL12 indicate efficient plasmid delivery after infection by recombinant invasive E. coli vaccine. FACS analysis showed greater than 70% of HeLa cells were expressing murine specific IL12 at 72 h after 3 h infection with the invasive E. coli vaccine. The positive control was endogenous IL12 produced by the mouse macrophage cell line RAW 264.7. Negative controls included invasive E.coli not carrying the murine IL12 expression vector (E. coli BL21 infected HeLa supernatant) and uninfected HeLa cells supernatant. Since we were interested in preparing a vaccine that would stimulate cell mediated immunity, we analyzed for a Th1 cytokine profile and specific CD8+ T cells. Performing real-time PCR gene expression profiling analysis on splenocytes from mice 5 h following vaccination with invasive E. coli vaccine or non-invasive E. coli, we analyzed for differences in primary immune response profiles. This time-point was chosen because typically, cytokines that promote T cell responses are measured 5 h post-immunization . Table 4 lists fold gene expression from splenocytes of animals receiving recombinant E. coli vaccine compared to control E. coli. The data were difficult to interpret since both key Th1 and Th2 cytokines were upregulated in E. coli vaccine immunized animals compared to E. coli control immunized animals. Most likely, the complexity of the cytokine profile can be attributed to the highly stimulatory LPS of E. coli [58, 59]. Comparison profiles of E.coli vaccinated animals to PBS control animals were also performed (data not shown), but the results were not relevant to our objective of determining whether the recombinant E. coli vaccine would elicit a different cytokine profile relative to control E. coli. Immune response gene profile of splenocytes after 5 h immunization with E. coli vaccine. aValues are real-time PCR expression of recombinant invasive E. coli vaccinated animals relative to expression of non-invasive E. coli vaccinated animals. Data were compiled from triplicate wells. T-test p value < 0.001. However, because of the mixed Th1/Th2 cytokine profile of the primary immune response, we decided to investigate whether the secondary immune response would give a more defining Th1 cytokine profile response to the antigen. RAW 264.7 macrophages were co-cultured with splenic T cells from groups of mice that had been immunized 4 weeks. Half of the cultures were supplemented with the H-2Kd-binding peptide HYLSTQSAL of GFP and supernatants were measured for cytokines after three days. GFP nonamer treated cultures showed a large increase in Th1 cytokine levels in E. coli vaccine immunized T cell groups with negligible change or decrease in Th2 cytokine levels (Table 5). Production of IFNγ significantly increased for the two specific invasive E. coli vaccines, GFPinv and GFPinvIL12 whereas production of IL4 increased for the negative control vaccines, GFP and ()invIL12 as well as significantly increasing in the PBS control samples. Although the primary response indicated a mixed Th1/Th2 profile, the secondary immune response indicates a shift to the Th1 profile. Identification of antigen specific CD8+ T cells would confirm a Th1 profile and generation of cell-mediated immunity. Three day cytokine production (pg/ml)a of vaccinated mouse splenic T cells cultured in macrophages with (+) or without (-) 50 μM GFP peptide HYLSTQSAL. aValues are from pooled T cells from four mice of each vaccine group. Data are compiled from two experiments. A significant change in expression is indicated by 2-fold or greater over non-peptide treated samples (p < 0.05) and is shown in bold text. Decreases are in italics. bNot enough cells to perform assay. To determine the proportion of CD8+ T cells specific for GFP antigen in the spleens of E. coli vaccine immunized BALB/c mice, we used H-2Kd MHC class I pentamer complex combined with the GFP peptide HYLSTQSAL (designated MHC-GFP pentamer) co-stained with CD8+ antibody and analyzed by flow cytometry. 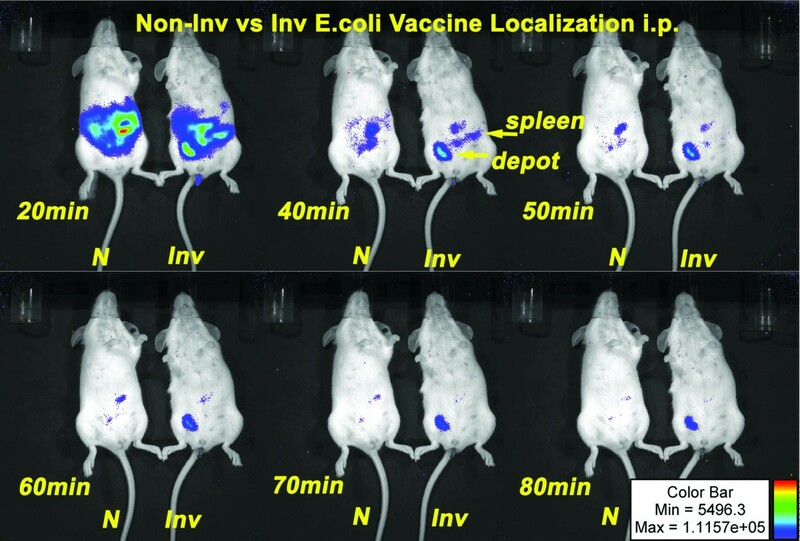 As shown in Figure 5, the invasive E. coli vaccine induced GFP peptide specific CD8+ T cells at a significant level (p < 0.05) greater than the non-vaccinated (PBS) and empty vaccine (()inv IL12; invasive without GFP) controls and at similar levels to mice given syngeneic APC's constitutively expressing the antigen (RAW/GFP). However, the non-invasive E. coli vaccine control (GFP) also induced notable levels of CD8+ T cells not significantly different than the vaccines (GFP inv and GFP inv IL12). The high number of specific CD8+ T cells induced by the invasive E. coli vaccines correlated with the Th1 cytokine up-regulation induced in the secondary immune response by these cells in vitro (Table 5). As a confirmation of E. coli vaccine generated cell mediated immunity, we analyzed cytolytic T lymphocyte (CTL) response. FACS analysis of splenic T cells co-stained with anti-CD8 and H-2K d -GFP peptide pentamer indicate increased numbers of antigen specific CTLs in recombinant invasive E. coli vaccine immunized animals. Groups of four mice were vaccinated with GFP-expressing E.coli that were either non-invasive (GFP), recombinant invasive (GFP inv), or recombinant invasive with murine IL12 expression vector (GFP inv IL12). Negative controls included recombinant invasive E. coli with the murine IL12 expression vector but without the GFP antigen (()inv IL12), and PBS. Positive control vaccine was irradiated mouse macrophage RAW cell line (H-2d haplotype) constitutively expressing GFP (Raw/GFP). Vaccinated mice were boosted after two weeks, and splenocytes harvested after four weeks. Splenocytes of mice immunized with the invasive E. coli vaccine vector expressing the GFP antigen were used as effector cells in cytotoxicity assays against RAW/GFP target cell lines. 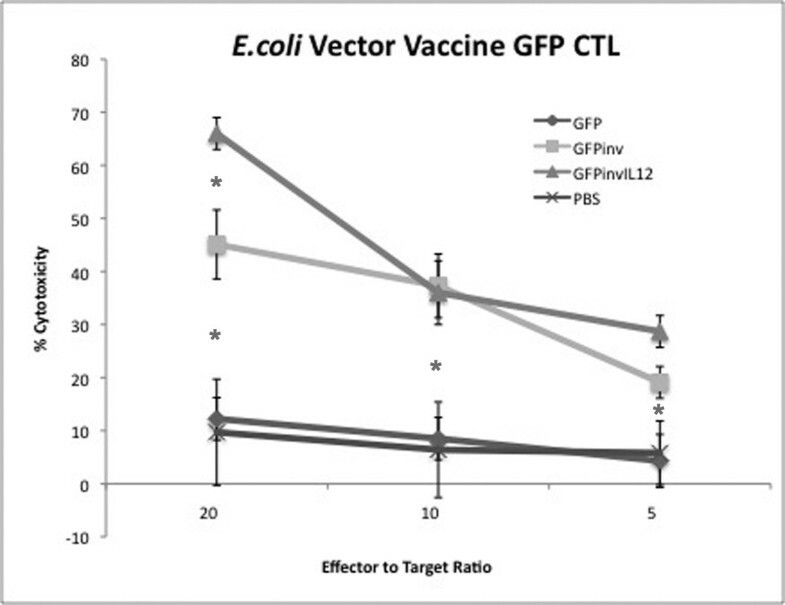 As shown in Figure 6, the invasive E. coli vaccine vectors (GFPinv, GFPinvIL12) elicited marked CTL response against the target cells versus the control non-invasive E.coli (GFP) and mock immunized (PBS) mice. To optimize the immunization protocol, we repeated this experiment with mice vaccinated with different doses of E. coli vaccine ranging from 104 to 108 cells in both primary and booster vaccines. Results (not shown) demonstrated that the highest vaccine dose (108) elicited the highest CTL results. Recombinant E. coli vaccine vector delivering GFP antigen induced higher CTL response. Effector splenocytes of mice immunized with E. coli-GFP (GFP), our recombinant vaccine vector E. coli-GFP expressing invasin and hly (GFPinv), the recombinant vaccine vector also carrying the eukaryotic muIL12 vector (GFPinvIL12), or diluent control (PBS) were incubated with Raw/GFP target cells and assayed for cytotoxicity. Error bars represent quadruplicate wells. 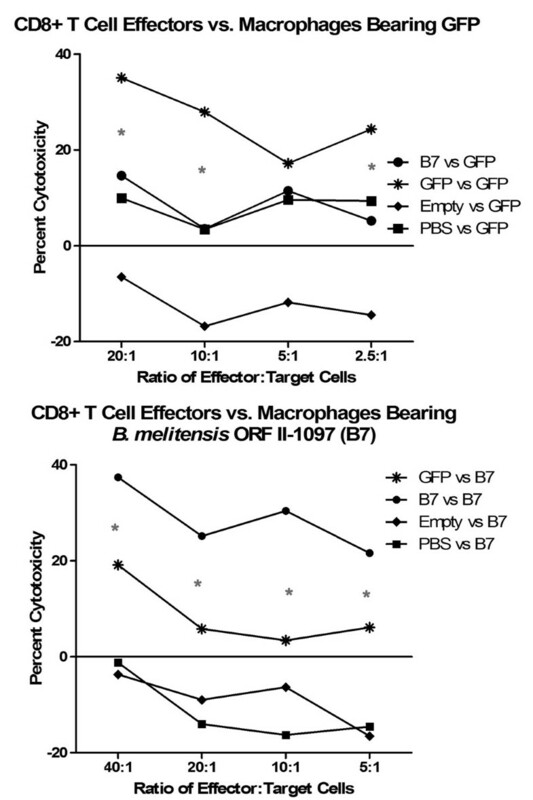 *GFPinvIL12 generated T cytotoxicity was significantly greater than GFP or PBS controls (p < 0.05). To identify the specificity of the CTL response, an E. coli vaccine expressing B. melitensis ORF BmeII-1097 (designated B7) as well as vaccine vector without antigen expression (designated Empty) was included. Antigen of this Brucella ORF had been determined by RANKPEP computer algorithm http://bio.dfci.harvard.edu/RANKPEP/ to have high binding to mouse H-2Kd. BmeII-1097 is a putative transcriptional regulator with homology to syrB. Cytotoxicity assays affirmed that CTLs generated by the invasive E. coli vaccine were specific to the expressed antigen of the vector (Figure 7). Recombinant invasive E. coli vaccine vector induces specific CTL response. Inv-hly E.coli vaccine vectors expressing B. mel ORF BmeII-1097 antigen (B7), GFP antigen (GFP), or no antigen (Empty), were used to immunize mice along with a negative (PBS) control. Splenocytes were isolated and used against target RAW macrophages expressing either GFP (Raw/GFP) or B7 (Raw/B7). Data demonstrate that CTLs generated by the E. coli vaccine were specific to antigen expressed by the vaccine. *GFP vs GFP and B7 vs B7 specific cytotoxicity were significantly greater (p < 0.05) than non-specific controls. There is no safe, effective vaccine against human brucellosis. The ability of Brucella to chronically infect humans is related to its ability to avoid a protective Th1 response [61–64]. Chronic brucellosis patients display a Th2 immune response [64, 65]. Our objective was to analyze a novel vaccine approach engineering E.coli to mimic invasion, immunoregulation, and antigen expression of Brucella without the pathogenicity of Brucella. Recombinant invasive E. coli have been used to deliver therapeutically relevant molecules to mouse and human professional and non-professional phagocytic cells [38, 66–70]. To date, use of recombinant E. coli as vectors has mainly been for delivering DNA for genetic vaccination. The ability to easily be engulfed by cells in addition to the absence of plasmid size restrictions make bacteria an interesting vector for gene therapy. In most cases, the recombinant invasive E. coli is used to efficiently enter eukaryotic cells where it is destroyed, releasing a eukaryotic vector to the host cell for expression of a therapeutic gene . Using this basic approach, we modified E. coli to be a live vaccine that would efficiently invade host cells, deliver a eukaryotic gene expression vector to help modulate the proper immune response, and release a large amount of antigen efficiently produced by the prokaryotic expression system. E. coli infection would not be long-lived, unlike live Brucella, being cleared by the host relatively rapidly. Nevertheless, we found our invasive E. coli could survive in host cells up to 72 h after infection compared to control E. coli surviving less than 3 h post-infection (data not shown). These data had been confirmed by others  and suggest an alternate pathway of infection for our recombinant vaccine E. coli. Bacteria enter cells through a variety of receptors. Host cell receptor(s) for binding and internalization of Brucella have not been identified but involve lipid rafts and components of this micro domain . The Brucella endocytic pathway is distinct from the classical endosome-lysosome pathway in that Brucella inhibit phagosome-lysosome fusion . Further, smooth Brucella infection of macrophages is inefficient with only 40–60% of cells infected in vitro after 1 hour . In contrast, E. coli are efficiently engulfed and processed through the classical endosome-lysosome pathway. However, this leads to rapid destruction of the bacteria and MHC class II presentation of antigen . To avoid this destructive pathway, we modified our E. coli vector to express invasin from Yersinia. This effectively made the vector 80–100% invasive to not only professional phagocytic cells, but to all cells expressing β1-integrin (Table 2, Figure 1). Further, the endocytic pathway was changed as evidenced that live recombinant E. coli could be isolated from macrophages after 3 hours (Table 2) whereas wild-type E. coli were destroyed. The pathway seemed to mimic that of Yersinia as demonstrated by TEM (Figure 2) where the bacterium adheres to a filopodium then is internalized to individual endosomes . The result is more cells internalizing the vaccine with potential to express antigen in association with MHC class I. Of great interest was the fact that in vivo, the vaccine expressed the reporter gene (lux) for a prolonged period at the site of immunization (Figure 3) as only viable bacteria continue to express lux. This confirms broad cell-type internalization and probable increased antigen presentation. In addition to invasin of Yersinia pseudotuberculosis our recombinant E. coli vaccine vector co-expressed the hly gene of Listeria monocytogenes on the same vector. Modification of the bacterial vaccine to express listeriolysin O (LLO) was to increase MHC I presentation of the expressed antigen delivered by the vaccine. As reported by others , the bacteria would be lysed in the phagosome/lysosome. Through the pore-forming action of LLO, the cytoplasmic contents of our bacterial vaccine vector (including the over expressed antigen) would then escape into the cytosol and thereby be processed by the proteasome. In vitro, this LLO-mediated process has been shown to improve MHC I presentation of antigens by macrophages and dendritic cells [34, 35, 43, 44]. In vivo, E. coli vaccines expressing LLO induced a very strong anti-tumor CTL response . We did not confirm improved MHC I presentation of GFP antigen by LLO in studies presented here. However, we did see less YFP gene delivery for mammalian cell expression using recombinant E. coli without LLO (Table 3; data not shown). Furthermore, a recent report demonstrated that the presence of LLO in a recombinant bacterial vaccine suppresses CD4+ regulatory T cell (Treg) inhibition of antigen-specific CD8+ T cell expansion . Primary immune responses activate antigen induced Tregs limiting vaccine efficacy . The cytokine profile of the primary immune response to our recombinant E.coli vaccine vector revealed a mixed Th1/Th2 profile suggesting a high population of CD4+ T cells and possibly Tregs (Table 4). However, the secondary immune response to the vaccine shifted to a Th1 dominant cytokine profile (Table 5) and subsequent generation of antigen specific CTLs (Figures 6 and 7). It would be interesting to determine whether LLO expression in our vaccine vector affected successful CTL generation and long-term CD8+ effector memory T cells. Three major regulatory cytokines, TNFα, IL12, and IFNγ, were increased in expression relative to controls in both primary immune response (Table 4) and secondary immune response (Table 5) using our recombinant E. coli vaccine vector indicating DC maturation and cell mediated immunity. TNFα is a multipotent proinflammatory cytokine fundamental for defense against a variety of intracellular pathogens and is primarily involved in DC maturation [76, 77]. DCs infected with E. coli clearly show a high capacity to induce the response of naïve T cells, and TNFα secretion by DCs infected with Brucella as well as E. coli was directly implicated in the maturation of these cells, since TNFα blocking antibodies cause a strong maturation decrease . Invasive E. coli vaccine, similar to Brucella, initiates the first phase of a T cell dependent adaptive immune response inducing the secretion of IL12 from APCs. IL12 then potently stimulates IFNγ production by activated naïve T cells . Both IL12 and IFNγ are considered essential for protection against brucellosis . Our inclusion of a murine IL12 mammalian expression plasmid in the E. coli vaccine vector results in a high level of IL12 expression in the infected cell (Figure 4). This IL12 rich microenvironment surrounding the host antigen presenting cell (professional or non-professional; Table 2) may be involved in supporting the Th1 profile of the secondary immune response as indicated by the high levels of TNFα and IFNγ (Table 5). The resulting maturation of DCs and CD8+ T cells would lead to cell mediated immunity. The initial host defense to infection is stimulated by pathogen associated molecular patterns (PAMPS) common to different groups of pathogens. The toll-like receptor (TLR) family has emerged as a major group of signaling receptors for PAMPs [79, 80]. Classical LPS activates macrophages and DCs through binding the TLR-4. Nevertheless, the respective effects of APC stimulation by isolated LPS or living bacteria are clearly distinct, even when the bacteria carry a highly active LPS like E. coli; the bacteria probably bind not only to TLR-4 but also to a set of various receptors. Our studies demonstrate a notable Th1, specific CTL response to antigen delivered by the invasive, recombinant E. coli vaccine vector. However, the highly active LPS and PAMPS of E. coli may over stimulate the immune response to the vector. Engineering the E. coli genome to make the organism less stimulatory to the host would greatly improve the usefulness of this novel vaccine approach. We began our studies with the goal of developing a live vaccine vector using an organism (E. coli) that was not pathogenic to the host and engineering it to mimic the bacterial pathogen Brucella intracellular infection to stimulate a protective cellular immune response. Our data show that this vaccine vector could efficiently infect cells of multiple tissues. These vaccine infected cells acting as antigen presenting cells can stimulate a cellular immune response with Th1 cytokine profile and specific CTLs. Studies are now in progress to determine whether this recombinant invasive E. coli vaccine vector, expressing pools of immunodominant Brucella antigens, would be sufficient to induce a protective immune response in mice. Our studies show that this novel vaccine could be applied to any disease where cellular immunity is required. This work was sponsored by the NIH/NIAID Regional Center of Excellence for Bio-defense and Emerging Infectious Diseases Research (RCE) Program. The authors wish to acknowledge membership within and support from the Region V 'Great Lakes' RCE (NIH award 1-U54-AI-057153 and NIH R01-AI-073558). We thank Dr. Catherine Grillot-Courvalin (Institut Pasteur, Unite des Agent Anti-bacteriens, Paris, France) for the kind gift of pGB2Ωinv-hly. JH, MD, and DD participated in mouse vaccination studies. JH and DD carried out pentamer staining and cytokine profiling. MD performed IL12 expression studies and flow cytometry. JH performed molecular and cell biology studies engineering and immunoassays. JH and GS conceived of the study, and participated in its design and coordination and helped to draft the manuscript. All authors read and approved the final manuscript.